Raised in California, exploration of our wine regions often re-acquaints me with early childhood memories. Beullton, CA, more specifically Anderson Split Pea Soup Restaurant, was always a stop while traveling to southern California in the late 50’s where I was reminded to remove my coonskin cap while eating. Johnson’s Beach, along the Russian River was my vacation playground long before it was the world’s greatest appellation. Arroyo Seco in Monterey County, now part of the Santa Lucia Highlands, was the site of annual camping trips with other families. Back then, I wasn’t paying much attention to where it was, simply doing my part by sitting in the backseat and asking “are we there yet”. Recent interest in the resurgence of German Riesling and its impact in the U.S., led me back to this area for the first time in over 50 years. With no pretense that this region produces the best Riesling or that it is produced anywhere in the Golden State, the terrior in Arroyo Seco and other parts of the Santa Lucia Highlands gives credence to its mounting reputation as a precious jewel in the creation of high quality California Chardonnay, Pinot Noir and, now, Riesling. For centuries, Riesling has been associated with Germany and the Alsace region of France, contributing nearly half of the world’s production. 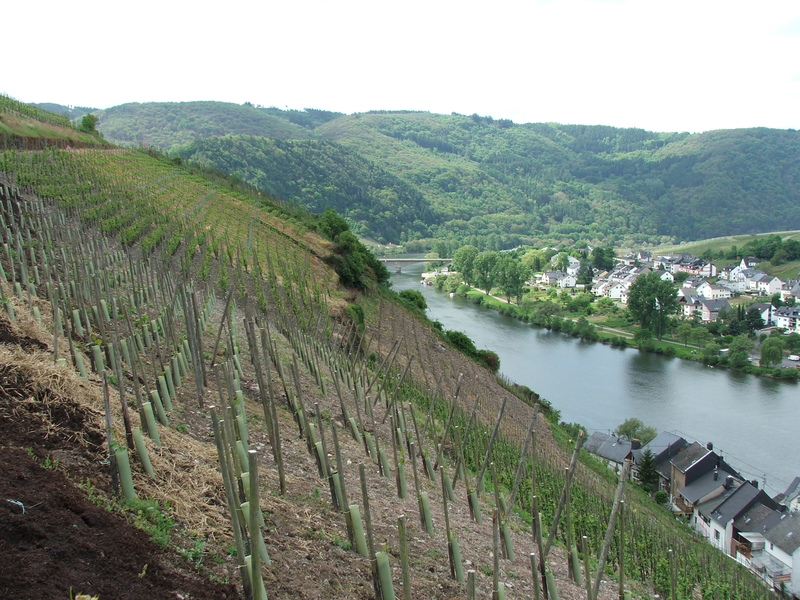 The northern Mosel-Saar-Ruwer (Mosel) region, located along the steep slopes above the Rhine River has been the perfect terrior for this late-ripening, cool weather grape. A resurgence of high quality German Riesling has occurred over the past decade and some climatologists are crediting an annual average temperature increase of 2-3 degrees. More heat allows the grapes to fully ripen, rising sugar content, resulting in longer, more concentrated finishes that appeal to those tasting and rating wines. The Alsace region, on France’s eastern border, also along the upper Rhine, provides nearly identical terrior that simply speaks another language and salutes another flag. However, the Alsace uniqueness is most expressed through their flagship bone-dry Riesling. Another alternative for Chardonnay, Riesling is generally a light wine with distinctive floral accents and flavors of orchard or stone fruits like pear and apple. Research will also discover descriptions of petroleum, terpene and mineral tastes associated with Riesling, a foreign concept that was recently given life during dinner with friends at CAV’ Wine Bar and Kitchen in San Francisco. Our sommelier recommended and served a bottle of 1996 Bolling Lehert Piesporter Goldtropfchen Riesling Spatese. From the initial taste, there it was; the petrol flavor of an aged German Riesling from the Mosel region, a myth no more. It seems that Riesling ages well, unlike most white wines. As you may have guessed, the experience was not like drinking terpentine. The petrol flavor was delivered subtly, offset by hints of traditional floral and fruit. We all discovered, firsthand, why the world cherishes aged German Riesling. The flavors were complex, layered and, true to form, perfectly balanced. To my amazement, I found this vintage at K&L Wines in Hollywood for $18 per bottle. The significant balance found in those from Germany and France is, according to most experts, lost in California Riesling. With only 2,500 aces of vineyards planted statewide compared to 95,000 for Chardonnay, history tells us that the quantity and quality of our Riesling will improve over time. For starters, it is now grown geographically in Santa Barbara, Monterey, Santa Cruz, Sonoma and Mendocino Counties, all accessible to cool, coastal breezes. Increased vineyards and networking will eventually find the perfect terrior and improve post harvest techniques. It is not common knowledge that before Prohibitiion, Riesling was the dominant white wine grape in the Napa Valley, creating the early California “Rhine wines.” After the repeal, new vineyards became consumed with trendy varietals as we desired to establish our own identity in the world, unable to compete with the European version. Today may be the beginning for adventurous viticulturists that envision a new market demand from the next generation. However, for this old “baby boomer,” patience is no longer a virtue and there is California Riesling to discover now. Botrytis, known as the noble rot, plays a major role in the creation of the Navarro Vineyards “October Revolution” Riesling ($18), arguably California’s best. Navarro Vineyards is in Mendocino County’s Anderson Valley, as cold and damp as any appellation in our state. Late harvesting of their Riesling allows the botrytis rot to set in, maximizing sugar content, resulting in a rush of classic orchard fruits and floral flavors. Navarro’s new “Starry Night” Riesling, harvested dusk through dawn, has received good reviews, boasting star jasmine aromas with hints of lime. The most food friendly Riesling I’ve tasted is the Fess Parker Santa Barbara County Riesling ($12), drier than most, projecting hints of peach on the palate. Those who find it difficult to pair wine with Thai food need look no further. Visiting Thomas Fogarty Winery, along the mountain ridge on Skyline Road in Woodside, above the peninsula between San Jose and San Francisco, is always an enjoyable tasting experience. Named for its founder, a former Stanford Medical School professor, the winery produces several quality varietals, including the Thomas Fogarty “Skyline” Riesling ($13), sourced from the Schied Viento Vineyard in the Arroyo Seco region of Monterey County. Those blessed with strong olfactics will enjoy the intense aromas of this dry wine that may need a trip to northern California to find. If not in California, where is our country’s best Riesling grown? Experts will answer, with confidence, that Washington State and the Finger Lakes region of New York State lead the pack. The most significant producer of Riesling in the U.S. is Chateau St, Michelle in the Columbia Valley region of Washington, totalling at least eight wines ranging in price from $9 to $35 per bottle. While the highest rated Chateau St. Michelle Dr. Loosen “Eroica” Riesling is sourced from Germany, all others are produced in the Columbia Valley, including the unique and pricey Ethos Late Harvest White Riesling ($35). Most, if not all, are rated in the nineties and are always a great value. Releases from Covey Run Winery and Hogue Cellars should not be shunned if the opportunity emerges. Having tasted a few fine Chardonnay wines from New York’s Finger lakes region, I am anxious to try their Riesling, especially the 2007 Weimer Vineyards “HJW” Dry Riesling, one that has received most of the accolades. The wines from this region are continuously improving and their future is still in front of them. Bonny Doon Cellars, known for thinking and acting “out of the box”, has created “Riesling to Live”, a unique sparkling wine from 100% Riesling grapes. It is an extraordinary tribute to a grape that deserves more respect. This entry was posted on Wednesday, May 18th, 2011 at 6:48 am	and posted in Wine. You can follow any responses to this entry through the RSS 2.0 feed.